The Dry Tortugas are a group of very small islands about 60 miles southwest of Key West. Garden Key is the largest and houses Ft. Jefferson. Construction on the fort began in 1846 to protect our southern border. It was rendered obsolete before construction was even finished by the invention of the rifled canon, which could rip holes right through the walled fortress. However, Ft. Jefferson was converted to a prison. Perhaps the most notable historic fact is that Dr. Mudd, who was convicted of aiding and abetting the injured John Wilkes Booth after the Lincoln assassination, served prison time here helping those prisoners with yellow Fever. 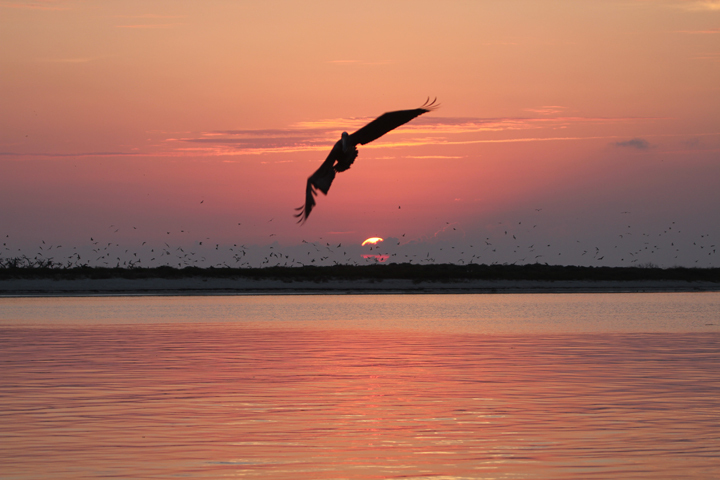 What’s notable for birders is that the Dry Tortugas host several breeding colonies found nowhere else in North America. A colony of around 80 Masked Boobies nest on Hospital Key. 80,000 Sooty Terns and 40,000 Brown Noddys nest right next to the fort on Bush Key. Brown Boobies usually loaf on the buoys within a mile of Garden Key. 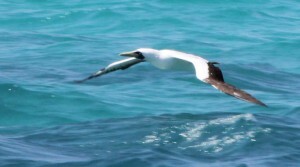 With luck, Black Noddys Red-footed Boobys and White-tailed Tropicbirds may be seen in the area or on the boat trip to and from the Tortugas. What really makes things exciting is a northwesterly wind and rain at night to force down neotropical migrants that are headed from the Yucatan Peninsula to the Texas, Louisiana and Alabama coast. Tucked in their midst could always be a Caribbean stray! The right conditions and Ft. Jefferson can be hopping with migrants. However, this wasn’t the case during our three-day trip to the island. The Monday morning boat trip to the Tortugas took us out into deeper water rather than the more direct route. We actually slipped into the Gulf Stream for a few miles, which usually hosts more pelagic species. Great looks at Roseate Terns were the highlight for me , this was a life bird. Other birds of note included Bridled Terns, Audubon’s Shearwater and a Masked Booby. This adult Pomerine Jaeger made a surprise appearance as well. Upon arriving at Ft. Jefferson, we docked and explored the fort for migrants. The birds were pretty scarce, but I added three warbler species and a Black-whiskered Vireo to the year list. Larry and I spent hours scanning the tern colony from the fort walls seeking in vain a Black Noddy. That night we ate dinner on the boat, it was delicious in fact all the meals were very tasty and healthy. Eleven customers on board plus Larry Manfredi, the tour leader, and a crew of three were cramped quarters, but that was made much more enjoyable by how nice and friendly everyone was. I bunked with Tom Rausch, Deb Bradley and Deanna Campbell and it was fun. The next day we birded Loggerhead Key in brutal sun and heat. The highlight was the Caribbean race of the Short-eared Owl, but little else to be had. That afternoon we birded the fort once again but there was little reward for our efforts. As the sun began to set, we were all thankful for some relief from the sun and enjoyed another excellent meal. That evening the winds began to shift and our spirits were buoyed by a wind out of the north. Not strong but maybe enough to allow some turnover at the fort. And that was the case. 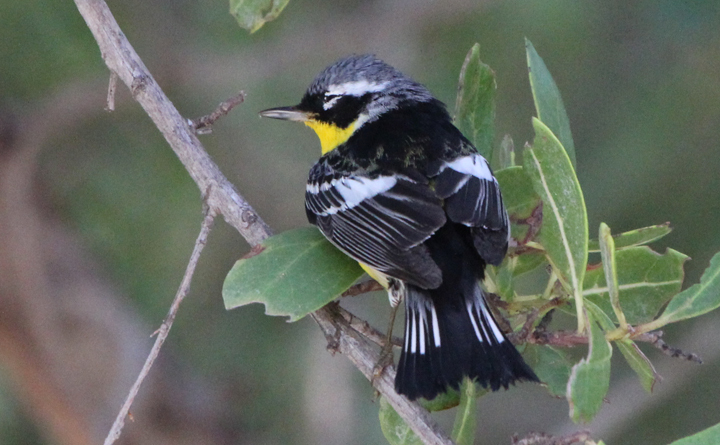 This adult male Magnolia Warbler, a Common Nighthawk, Bank Swallows and 8 warbler species all added to the fun. Unfortunately we departed the Tortugas at 9:00 AM for the slow trip back. The highlight of the return trip were 200 to 300 Bridled Terns sitting on massive bunches of seaweed over a 5 mile stretch. I’ve pondered whether the tour is the best way to see the Tortugas. You can do it yourself by taking the ferry and camping for a night or two outside the fort. Either way you’d get the Masked Boobies and most likely the Brown Booby as well. 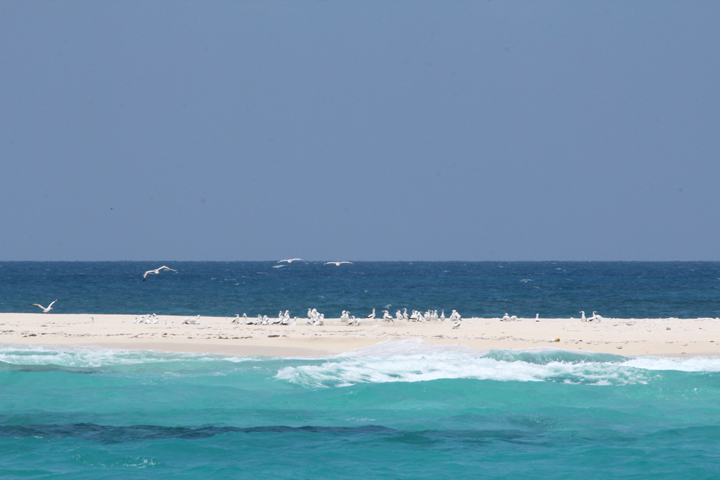 I would not have seen the Roseate Terns, but then again the ferry had a White-tailed Tropicbird. Larry’s tour is reasonably priced and he’s a good birder who works hard to find his participants birds. I’d give a slight edge to Larry Manfredi Tours. Upon returning to Key West I immediately called the local hotshot, Carl Goodrich. He’s found mega rarities such as Loggerhead Kingbird, Thick-billed Vireo and Florida’s first record of Neotropical Cormorant. We birded till dusk, but it was also pretty slow and of course no Antillean Nighthawk . Carl and his lovely wife Susan were gracious hosts and I felt privileged to be their guest for the evening. 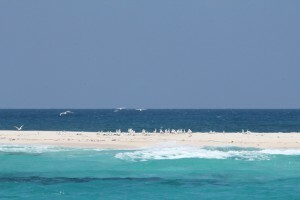 In summary, I added eighteen new year birds on the Dry Tortugas trip. If you ask was it worth it to take the tour rather than doing it yourself I’d say yes. This afternoon I fly to Houston where my son Scott will pick me up at Hobby Airport. We’ll have dinner with my brother, Bill, and then head off for Pt. Arthur. On Monday, the great Texas adventure will begin! Stay tuned. This entry was posted in Blog and tagged Dry Tortugas. Bookmark the permalink. There are so many boobies in this post that your blog will probably not be accessible from public school computers. as dad would say. . .”oh how sophmoric Scott”. . . .I’m glad you said it instead of me! p.s. who the hell ever named these birds anyway?!? OK you two-I was happy that I saw a Yellow-bellied Sapsucker on Friday. That’s one of most widely ridiculed bird names ! Dumb luck that they had White-tailed Tropicbird from the ferry. That may not have happened before.